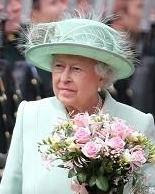 The Queen arrived at the Palace of Holyroodhouse, Edinburgh, at the start of her annual week of Scottish engagements. Her Majesty was presented with the Keys of the City which she returned in the traditional Ceremony of the Keys. The Guard of Honor from A Company, The Royal Scots Borderers, 1st Battalion The Royal Regiment of Scotland mounted in the Forecourt of the Palace was reviewed. The Queen, Patron, later watched a performance from The Royal Country Dance Society at the Palace of Holyroodhouse. I believe the Queen was wearing a regimental badge - I suspect the Royal Regiment of Scotland Badge - for her arrival, though that glorious bouquet certainly stole the show. Later, she switched to her classic Victoria Bow to watch some dancing.